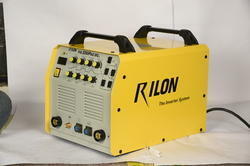 We are engaged in offering a varied assortment of TIG Welding Machines. These TIG Welding Machinesare manufactured using supreme quality raw materials and used in array of applications. Few of its attributes are durability, toughness, Unbreakable steel body, supreme performance and corrosion resistance. Current rating : 200-600 amps. 80 volt DC, current adjustable thyristerised with HF unit, water cooled and air cooled torches with all standard accessories. We manufacture all types of TIG Welding Machines. We offer our client an excellent quality range of TIG Welding Machine which are manufactured from high grade quality raw materials. These TIG Welding Machine can be customized as per our precious customers specifications. - Portable and Easy to Operate. 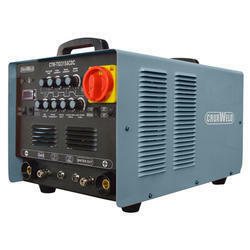 AC TiG welding machine, current rating : 200-600 amps. 100 volt AC, current adjustable step less control with HF unit DC suppressor water and with all standard accessories. Applications : Aluminum welding, Copper welding, Brass welding and other non-ferrous metals. We offer precision engineered range of inverter based tig machines, which are in compliance with set industrial benchmarks. Fabricated from superior quality raw materials, these machines are used to weld mild steel, stainless steel, copper & titanium. We have gained immense expertise in offering wide range of CT Series (TIG/MMA/CUT). It is widely appreciated by our clients which are situated all round the nation.